Shop with Complete Confidence - 100% Customer Satisfaction Guaranteed! Please e-mail me and we can discuss your ideas for the one of a kind baby quilt you want. Let's get started on your special order today! Please allow 2 to 3 weeks for your custom quilt to be made. Be sure to check out The Baby Quilt Gallery Page to see the most recent custom baby quilts ordered by other satisfied customers. 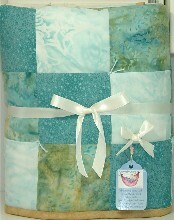 Handmade baby quilts... are an unforgettable baby gift, given from the heart. Every item is handcrafted with only the finest fabrics and craftsmanship. Our customers really appreciate the value and the quality of service they receive here at Cozy Baby Quilts. You can read some of their comments here.Cozy Baby Quilts offers you 100% customer satisfaction, guaranteed! You'll enjoy shopping at our baby quilt store because you have so many beautiful quilts and blankets to choose from - something special for everyone. 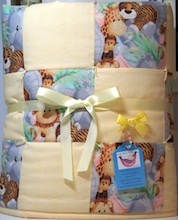 Every item is unique; many of the baby quilts and security blankets are one of a kind. We love to create custom baby quilts so if you can't find exactly what you are looking for or would like a personalized baby quilt please feel free to contact us. All of our handmade baby quilts and security blankets are so easy to care for; just machine wash warm, tumble dry low and remove promptly. Every time you wash them they get softer and softer; our son tells me his favorite thing about his quilt is; "it has a loved feel to it, mommy" - I love those precious phrases that he comes out with! So, don't be afraid to use your baby quilt or blanket because they just keep getting better and more loved. We are located in beautiful Rhode Island, otherwise known as "Little Rhody" and have more than 30 years of quilt making experience. We've been online for 10 years now and still going strong! Give a Personalized Baby Quilt ~ You can order one in any color you want, the possibilities are endless! Receive a Handmade Greeting Card with every baby quilt you purchase! Shop for handmade baby quilts with ease! 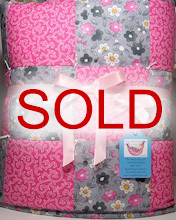 Baby Girl Quilts - a baby quilt becomes a family keepsake. 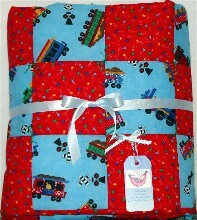 Baby Boy Quilts - a cherished baby gift that offers security and warmth. 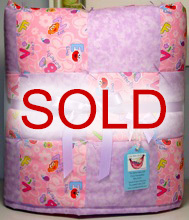 Baby Girl Quilts or Boy Quilts - a baby quilt gives comfort. 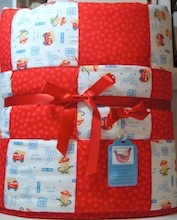 Bassinet Baby Quilts - a baby gift that offers versatility and convenience. Personalized Baby Quilts - give a personalized baby quilt, a baby gift to be treasured always. Order Information - quality customer service - safe - secure online shopping. About Us - find out more about Cozy Baby Quilts. Baby Quilt Gallery - custom baby quilts that have been made for recent customers. Resources - family and baby related web sites on the web. Customer Comments - read for yourself what other customers have to say. Baby Bedding Safety Tips - some great information on safe bedding for your infant. Offering you fine quality baby quilts at the best value! Baby quilts are a great unique baby gift. Expecting a baby is a wonderful and happy time in every woman's life, so give a baby quilt that will be treasured for a lifetime. A quilt can be given anytime during a baby's life. Give one that coordinates with the crib bedding in the baby nursery or for extra baby bedding, as a christening gift. Handmade baby quilts are also wonderful for older childern to cuddle with at nap time or on the go in the stroller or car, used for toddler bedding, on the floor or in a playpen for extra comfort and warmth. A handmade baby quilt is a long lasting family heirloom! So, celebrate your pregnancy or someone you know that's expecting by giving a beautiful handmade baby quilt, it will certainly be enjoyed for many years to come. would like to leave feedback please e-mail us. © Cozy Baby Quilts. All rights reserved. Logo/Art Images are property protected. Designed by Cozy Baby Quilts.